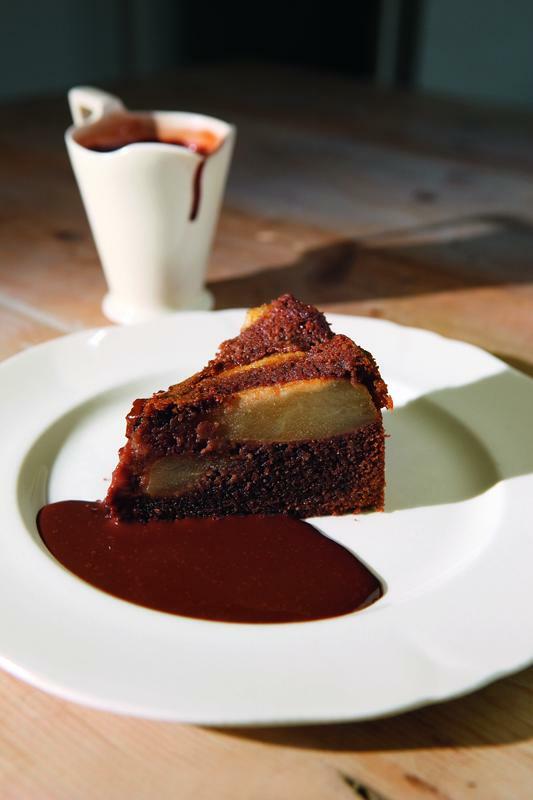 This is a chocolatey variation on the classic River Cottage apple and almond cake. And, since pears and chocolate go so well together, we couldn't resist adding a simple chocolate sauce as well. Preheat the oven to 170°C/Gas 3. Butter a 20cm springform cake tin and line with baking parchment. Peel, quarter and core the pears. Melt the butter in a frying pan over a medium heat. Add the brown sugar and orange zest and stir until the sugar has dissolved. Add the pears and cook them gently for a few minutes, turning frequently, until completely tender. Set aside. For the cake, combine the ground almonds, flour and cocoa powder and set aside. Beat the butter and sugar together with a handheld electric whisk or in a mixer for several minutes until very light and fluffy. Beat in the eggs, one at a time, adding a spoonful of the almond mix with each. Fold in the remaining almond mix, with a large metal spoon or spatula, then stir in a little milk to get a mixture with a soft dropping consistency. Spread this cake mixture in the prepared tin and arrange the pears on top, finishing them off with any buttery, sugary juices still in the pan. Bake for about 45 minutes, or until a skewer inserted into the centre of the sponge comes out clean. Leave to cool slightly in the tin. To make the sauce, break up the chocolate into small pieces and put into a heatproof bowl with the cream, sugar and 2 tablespoons water. Set over a pan of just-simmering water, making sure the water doesn't touch the base of the bowl and leave to melt, stirring once or twice. When melted, stir until smooth to give a glossy sauce with a thick pouring consistency; if necessary, stir in a tiny splash of hot water. Serve slices of the cake, ideally still warm from the oven, with the hot or warm chocolate sauce.